Dementia and its accompanying woes cost the country $1.4 billion every year, making it among the biggest drains on the healthcare system here. 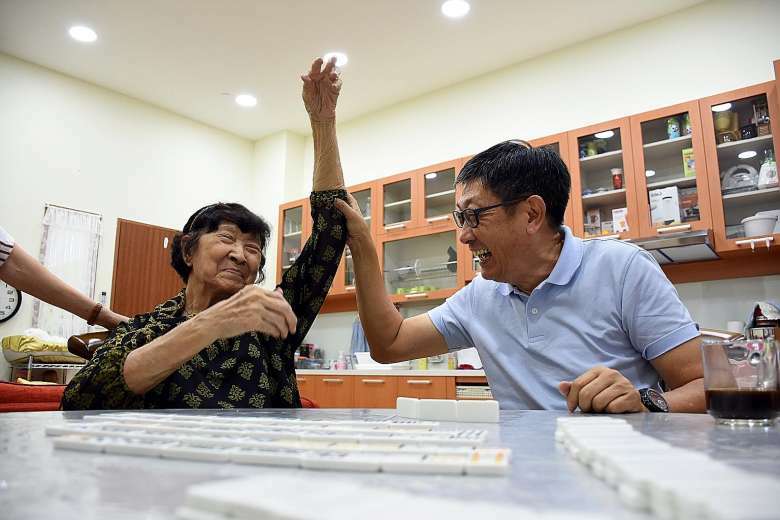 This alarming figure, uncovered for the first time by local and international researchers, underscores the need to prevent the debilitating disease from taking hold in greying Singapore, say experts. "Part of trying to define the scale of the problem is finding out dementia's economic cost," said Professor Chong Siow Ann, vice-chairman of the Institute of Mental Health's medical board (research), who was involved in the study. "That then gives us an idea where we might want to intervene." He and 13 others, from IMH, Changi General Hospital, the Ministry of Health and King's College London analysed the social care costs - such as care provided by family members and maids - and healthcare costs of 2,565 people, the majority of them aged 60 to 74. About one in 10 of them had dementia - consistent with the national average. What the researchers found: For every person with dementia, he, his family and society paid $10,245 more in health and social care costs in 2013 than those without the condition. As a country, Singapore shouldered the burden of $532 million that year, to care for people with the brain disease marked by memory disorders, personality changes and impaired reasoning. Taking into account social factors and other health problems dementia patients tend to suffer from such as depression and hypertension, the cost triples to $27,331 per person. The study offers an important benchmark for the illness, said the researchers, who are calling in particular for more help for caregivers. Said Dr Chia Shi-Lu, who chairs the Government Parliamentary Committee for Health: "Such studies do provide grist to the policy mill and are useful to either start or bookend discussions about resource allocations for specific medical issues, in this case dementia." Last month, the Government declared war on diabetes, which cost more than $1 billion in 2010 - a figure expected to soar beyond $2.5 billion by 2050. The estimated cost per working-age person due to diabetes was $7,678 in 2010, and is expected to go up to $10,596 by 2050. As at 2013, the annual cost of dementia, at $10,245 per patient, already closes in on the 2050 mark for diabetes, experts pointed out. The price tag is expected to grow exponentially as the country ages. There were about 40,000 dementia patients here last year and this is projected to reach 53,000 by 2020, and 187,000 by 2050. Notably, the study found that over three-quarters of the money spent on dementia patients comprises social care such as income lost when caregivers take time off work, while the rest is due to healthcare costs, including hospital admissions and doctor visits. Associate Professor Phua Kai Hong of the Lee Kuan Yew School of Public Policy at the National University of Singapore said there is still a lack of professional outpatient care here such as rehabilitation services or care for a patient's daily needs. "If you look at Singapore, most care is absorbed by the family or at most shows up as the cost of hiring a maid," Prof Phua said. Placing the burden squarely on these two groups would result in poor care for Singapore's elderly and heavy stress on caregivers, he warned. Dr Jeremy Lim, a partner in global consulting firm Oliver Wyman, said there is a need to be creative in finding solutions. This includes changing the subsidy model to recognise the high social costs and give more subsidies not just for medicine and institutional care, but also in areas such as transport and elderly-friendly infrastructure for homes, for instance. "More of the same, meaning more of today's care model, will doom us to failure," he said.